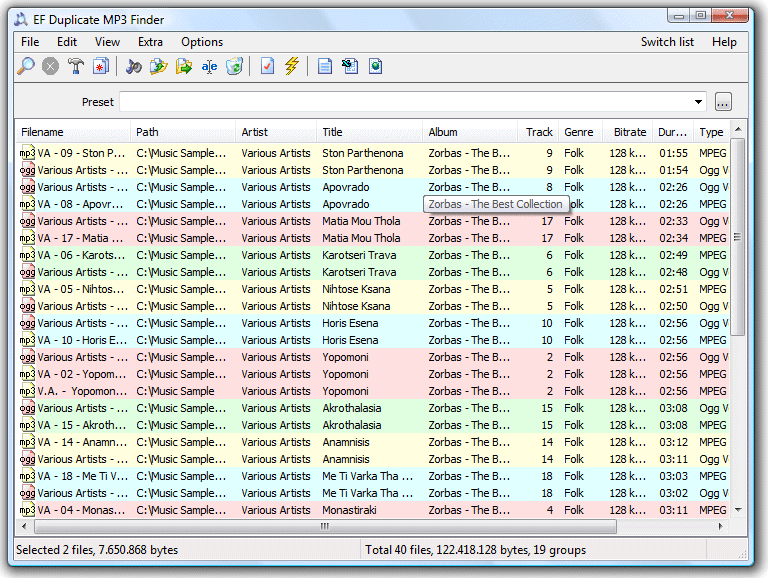 Find out duplicate or similar MP3, WMA, FLAC, OggVorbis files. ...... You can adjust individually if search for exact dupes or for similar files. In this way it is possible to identify similarly titles with smaller differences. Qweas is providing links to EF Duplicate MP3 Finder 5.30 as a courtesy, and makes no representations regarding EF Duplicate MP3 Finder or any other applications or any information related thereto. Any questions, complaints or claims regarding this application EF Duplicate MP3 Finder 5.30 must be directed to the appropriate software vendor. You may click the publisher link of EF Duplicate MP3 Finder on the top of this page to get more details about the vendor.